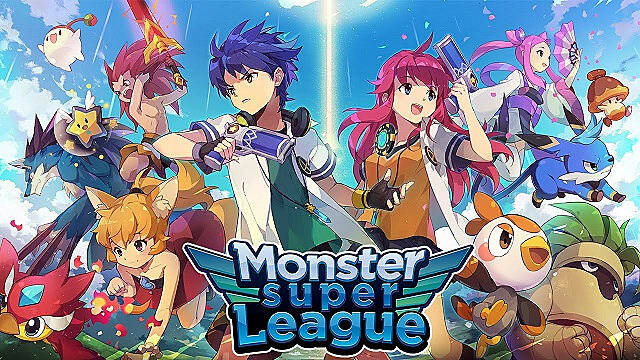 Monster Super League is a turn-based RPG for iOS and Android that was developed by SMARTSTUDY and published by the company 4:33 Creative Lab. Released on September 7th, the gameplay is similar to the Pokemon series. MSL focuses on capturing, raising, and battling with fantasy monsters in a battle of Order vs Chaos. The game features a story mode as well as a player vs player mode, which you may participate in even when you are not playing the game. 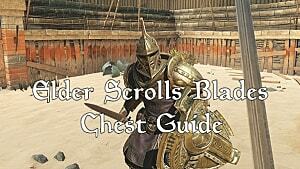 When you begin the game you'll be put through a rather comprehensive tutorial, which will teach you all the basics. Once you've finished that tutorial you should have a general understanding of essential skills: capturing, battling, feeding, gems, missions, and the special shop. You might be wondering what to do once you've finished your tutorial however, and I'm here to help. 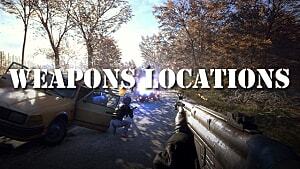 Let's start by covering some very important information that the tutorial does not. Variant Astromon are identical to standard versions of that Astromon, but have their Leader skill unlocked. The Shady Shop sells precious items at a very good price, and the stock changes and refreshes every hour. 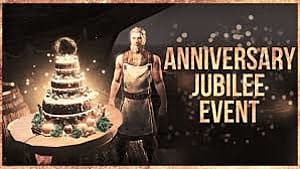 The Airship will have three shining spots that you can tap repeatedly for a total of 1200 Gold and three random items for free. Astromon League resets every Monday at 12:00am local time. If you are seeking to capture a specific Astromon, you can use the Story/Habitat button in the Astroguide to find out where they are available from. 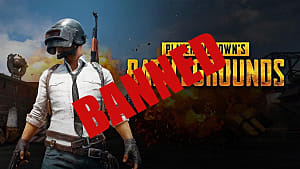 You may only delete five friends from your friend list per day. If you wish to automatically refill Astrochips (used to capture Astromon in combat) every time you head into a battle, you can turn "Autofill Astrochips" in the Team Select screen before entering a stage. Tap the chip directly above the "Battle" button so it says "On". To unlock harder difficulties you need to complete all stages on the continent. To enter Phantom Forest (Hard) you need to complete all the stages on Normal from Phantom Forest until you finish Mirage Ruins. This applies to the next continent as well. HP is how much health an Astromon has, the higher the value, the more damage is required to defeat that Astromon. Attack increases the amount of damage that Astromon does when attacking or using skills. Defense decreases how much damage an Astromon receives when attacked by the enemy. Recovery affects how much HP and SP you gain when absorbing orbs or being hit by recovery skills, as well as how much HP is regenerated between rounds. Crit DMG is an indicator how much bonus damage your Astromon's critical hits will do. Crit Rate shows how often your Astromon will critically hit the opponent. Resist shows how how likely the Astromon is to avoid being inflicted with an abnormal status effect. With a firm understanding of stats you can take advantage of equippable gems much more easily. Astromon with particularly low HP would best benefit from gems that increase HP or defense for example. Alternatively you can attempt to increase their damage further at the expense of safety by slotting gems that increase their Attack, this can backfire however if you are not careful with your Astromon's fragile HP in combat. 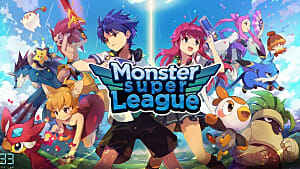 Monster Super League uses several different currencies for various shops and functions. The most important currencies are Gold and Astrogems. Gold is the primary currency of the game and is, by extension, exceptionally valuable to players. 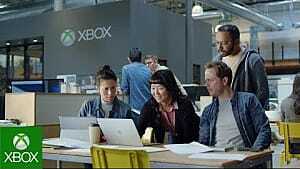 If used carelessly, you can quickly find yourself broke and penniless. 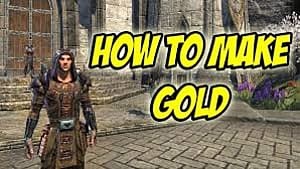 However, there are several ways to acquire gold. These methods are all viable, though not all of them are easy and some can be time-consuming. Try each of these methods and find what works best for your schedule. Astrogems are the in-game representation of real world currency. Players can easily acquire loads of Astrogems by using their wallet if they so choose, however, if you wish to avoid paying for this currency you have several options to earn Astrogems slowly but steadily. Weekly reward from Astromon League (PVP), the amount received varies depending on your rank when the weekly league concludes. Use 600 Astrogems in the Special Shop to perform a 10+1 Summon. Spending 10 Astrogems allows you to instantly defeat a boss. 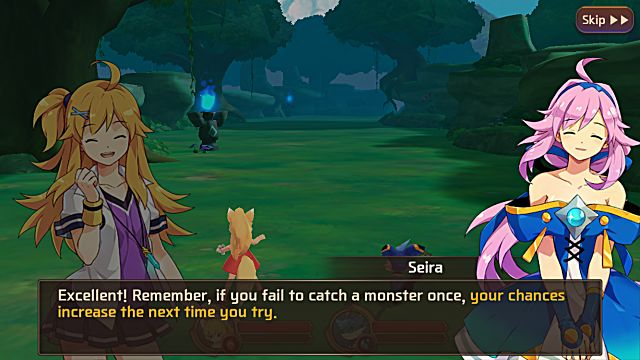 All bosses can be defeated with enough time, though if you need to bypass a particularly difficult boss this option is available. 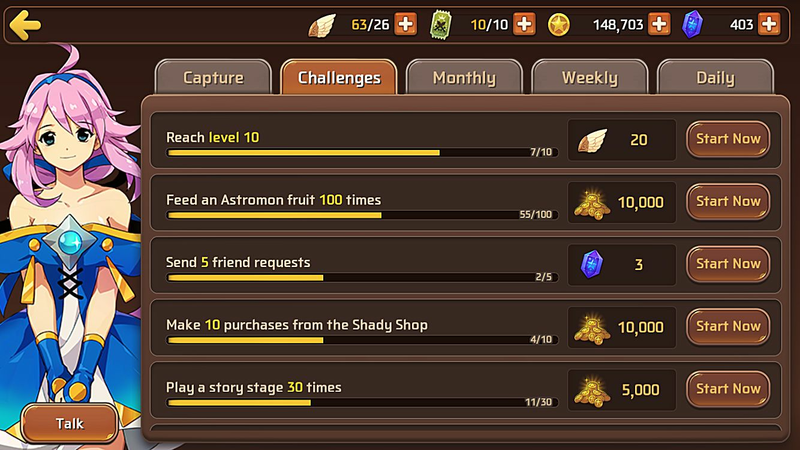 Spending Astrogems to refill Energy or League Tickets if you run out of League Tickets or Energy and do not have time to wait for them to refill. Wildfang (Fire) is a great offensive unit that comes with a strong HP heal that scales off of Attack. This provides longevity to your damage dealer. Yuki (Fire) has one of the highest Attack stats available but particularly low HP. With good use of Equip Gems you can easily create a deadly combatant for use with your team. Seirin (Water) can heal herself for 20% of her HP, though her HP is particularly low you can use Gems to balance this out and create a very durable unit. Wildfang (Water) is a decent tank with the ability to stun any unit that she critically hits. This is invaluable during PVP. Mona (Wood) is similar to Seirin (Water). Boltwing (Wood) is a bit more challenging to make good use of, but with enough effort and farming you can Ascend this unit to Rarity 5 and gain access to a full team heal that is very powerful. Latts (Starter) has an invaluable Leader Skill for PVP. 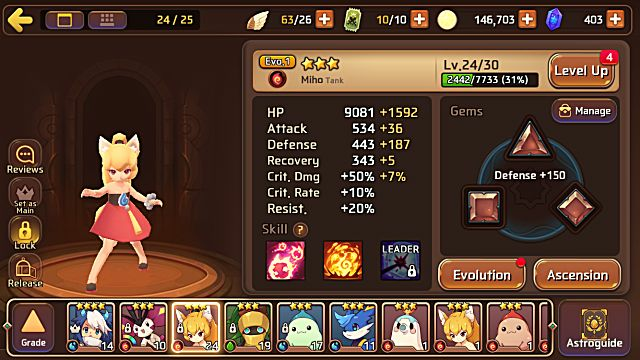 Miho (Light) is a great tank with very high defense and the ability to Taunt enemies, forcing them to attack her instead of your more fragile units. Victoria (Light) gains Attack proportional to Defense, making this unit a very strong brawler. Glos has an invaluable Leader Skill that you can make use for just about every single team composition. Miho (Dark) gains Attack proportional to HP, but is only summonable through the use of Rebirth. Woolf (Dark) is a slightly weaker version of Miho (Dark) but is available through an event that is running until 9/19/2016. Ascension is the primary means of increasing the strength of your Astromon permanently. Once you have decided on an Astromon you want to train to maximum potential, you'll need to start working on Ascending that Astromon. 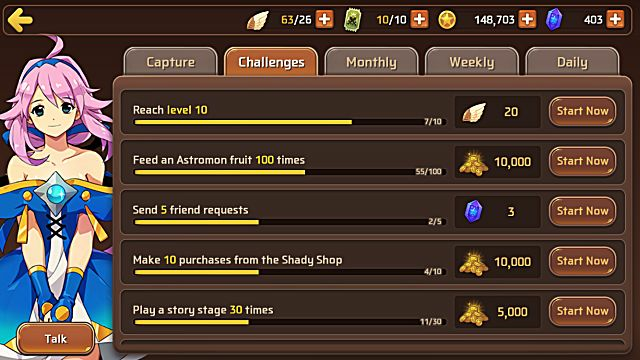 This means you need to gather large numbers of Starstone and Elementstone, as well as reach the max possible level with your Astromon. 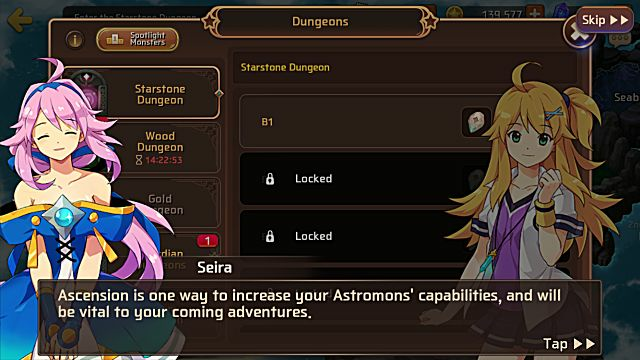 However, these stones are easily farmed from Dungeons once unlocked and simply requires time and dedication to acquire the proper amount of stones required. Ascending an Astromon increases its Rarity by one, meaning that if you ascend a Rarity 1 Astromon it will become Rarity 2. Ascending that Astromon again would result in a Rarity 3 and so on. This increases the Astromon's level cap and unlocks various skills as they reach Rarity 3 and Rarity 5. However, each ascension will result in the Astromon returning to level 1, requiring you to train the Astromon to maximum level again before being able to ascend to the next Rarity. Evolution, on the other hand, is a process in which you alter the appearance and stats of your Astromon permanently. This process requires you to capture multiple copies of the same Astromon regardless of element or make use of Gleems of the same Element as your desired evolution. Gleems are a unit that can be purchased using League Medals, which are earned through PVP. This means that if you wish to evolve rare Astromon you should make use of your League Tickets to PVP often. Win or lose you will eventually acquire enough medals to purchase your desired Gleems. Once you have acquired three duplicates or element appropriate Gleems you can sacrifice them as awakening material to reach the next stage of evolution. These ranks are known as "Evo" and are indicated beneath the unit you are examining. 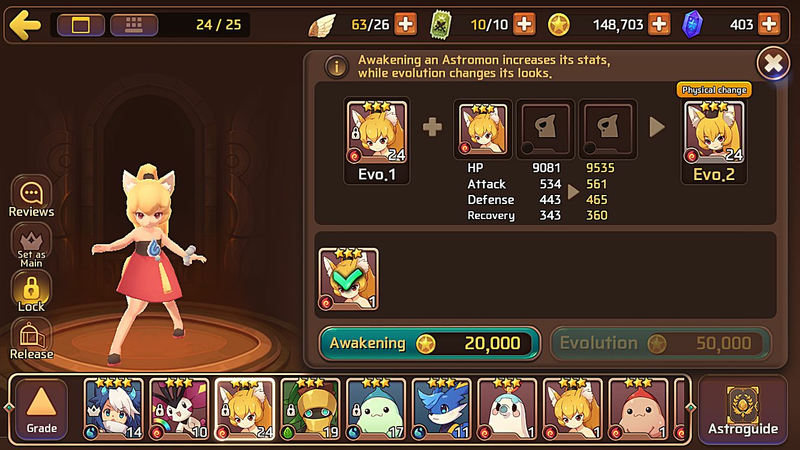 This is important, as the only way to evolve from Evo.2 to Evo.3 is to use 4 duplicate copies (or Gleems) of your Astromon that are also Evo.2. 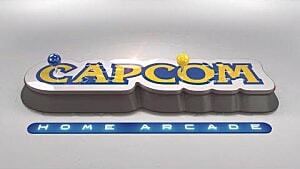 This means that to go from Evo.1 to Evo.3 you would need sixteen copies of your desired Astromon at Evo.1. This process can take a long time, but it is necessary to get the most out of your favorite Astromon in combat. In addition to all of this, using a Variant at any time during this process will cause all Evolutions from then on to become a Variant. This means that your Evolved unit will have access to it's Leader Skill. You can also use any Evo rank variant as an awakening material on a Evo.3 unit to change that Unit into a variant automatically. Finally, we have Rebirth. Rebirth requires you to sacrifice natural Rarity 3 or higher units in order to create a randomly generated unit from a specific list -- which is visible on the Rebirth menu. This process can be valuable for exchanging particularly weak units into something far more valuable. Additionally, using variants in this process will increase the likelihood that the unit you receive will be a variant by 5%. This means that using five variants as sacrifices will result in a 25% increased likelihood of getting a variant. However, variants themselves are hard to come by, so this is a bit of a stretch. 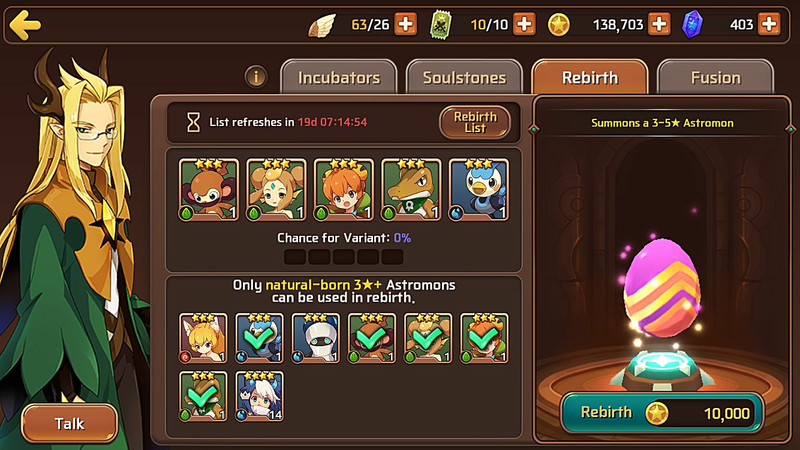 Soulstones are another way to summon Astromon. Each soulstone is unique to each Astromon, by collecting these soulstones from dungeons you can summon specific Astromons of your choice. 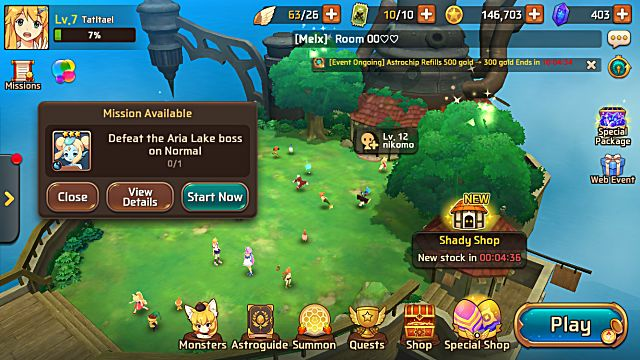 In addition to dungeons, you can also purchase soulstones from the Shady Shop and some are available from the free Adventure Package. This may go without saying to some, but the most important part of a game like this is to enjoy it. If you're not having fun you really can't achieve the greatest possible success. So take your time, enjoy the story, play with your favorite Astromon and explore the variety of every possibility you find interesting. Monster Super League is a great way to kill time and have fun, so grab your Astrogun and stock up on Astrochips, it's time to go adventuring!